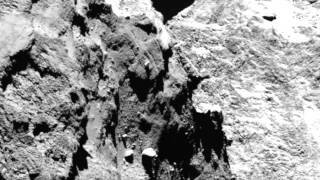 Update #4: On the surface of today’s most well-studied comet, we see fields of rubble everywhere. From great boulders down to gravel, sand and dust, a surface littered with debris. Why would an evaporating clump of ice and dust look more like the debris-strewn surface of Mars than any comet that scientist ever dared to dream of? JOIN THE PLANETARY SOCIETY. Our Curiosity Knows No Bounds! Become a member of The Planetary Society and together we will create the future of space exploration. The Rosetta mothercraft launched from Earth 10 years ago with the probe named Philae. Rosetta traveled 6.4 billion miles before arriving at the comet in August. Saudi Arabia's SECRET to Cause a MASSIVE Drop in Price of Oil! The E.S.A. Lies About The 67P Comet !